Tom Sutcliffe and his guests writer Natalie Haynes, novelist Louise Welsh and musician Pat Kane review the cultural highlights of the week including the film In A Better World. Tom Sutcliffe and his guests writer Natalie Haynes; novelist Louise Welsh and musician Pat Kane review the cultural highlights of the week including In A Better World. This award winning Danish film tells the story of Anton, a doctor who commutes between his home in an idyllic town in Denmark, and his work at an African refugee camp. His older son Elias is being bullied at school but is befriended by Christian, and the boys form a strong bond, but when Christian involves Elias in a dangerous act of revenge their lives are put in danger. Precious Light is a contemporary celebration of the King James Bible by David Mach. 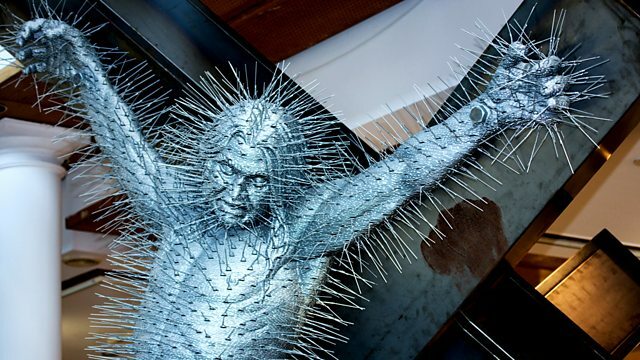 His exhibition of sculpture and collage is at The City Art Centre, Edinburgh and features a dramatic depiction of the crucifixion at Calvary, sculptures made from match heads and coat hangers and his trademark witty and intricate approach to collage. Turner prize winning artist Tony Cragg's exhibition at the Scottish National Gallery of Modern Art features around fifty major sculptures, some of which are on a monumental scale and are sited in the Gallery's grounds. Cragg has worked in materials such as plastic, bronze, glass, stainless steel and wood. The novel The Cat's Table by Michael Ondaatje is set in the early 1950s, when an eleven-year-old boy boards a ship bound for England. At mealtimes he is seated at the "cat's table" with a ragtag group of "insignificant" adults and two other boys. As the ship makes its way across the Indian Ocean, through the Suez Canal and into the Mediterranean, the boys tumble from one adventure to another, "bursting all over the place like freed mercury." But there are other diversions: one man talks to them about jazz and women, another about literature. And at night, the boys spy on a shackled prisoner - his crime and fate, a mystery that will haunt them.